The most visible house after Villa Sobhani -- before it mutated into a Cairo Sheraton and a privately-owned apartment building -- is a large redbrick house recognizable by its numerous pillars, pergolas, three-arched windows and stucco ornaments. This is now the Russian Embassy (No. 88 al-Nil Street). It was built in 1926 or thereabouts for banker Joseph Nessim Mosseri Bey who lived there until his death. A pious man, Mosseri Bey had his own place of worship at the south end of his garden. It was there that his eulogy was officiated on 14 January 1934 by Egypt's then-Grand Rabbi Haim Naum Effendi. According to al-Ahram, Mosseri's funeral was attended by Prime Minister Abdelfattah Yehia Pasha and his entire Cabinet. Among weighty mourners who enjoyed extensive credit at Banque Mosseri were former and future prime ministers Ziwar, Sidki, Sabri, and Maher Pashas. The imposing funeral procession was lined with an honor guard up to the Zamalek side of the Pont des Anglais. From there, the coffin was carried by special car to the Mosseri vaults in Bassatine, south of Cairo. Mosseri's widow, Jeanne Aghion, continued to live at Villa Mosseri until the mid-50s. Residing with her was her eldest son Guido and his wife Joyce, daughter of Alexandria's suburban developer, Youssef Smouha. 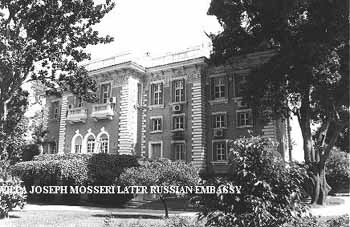 When the American State Department declined to buy her villa, Madame Mosseri sold it to the Russian government which promptly turned it into a residence for its ambassadors. Later, the Russians would amputate part of the garden to accommodate the embassy's massive white chancellery. Behind Joseph Mosseri's house, just across the main street, one can still glimpse No. 60 Giza Avenue. This was where Joseph's learned cousin and brother in law, Victor Moussa Mosseri, lived. Even as it lies squashed between a tall building and the Pyramisa hotel, its architecture is worth a second look, particularly its gothic arches and its accouterment of Victorian follies: gargoyles, pointed chimneys, etc. Meanwhile the adjoining homes of Joseph Mosseri Bey's other brothers, Felix and Emile, are gone. What was their villa at No. 58 Giza Avenue has become a gaggle of high rises. Across the narrow Mosseri Street (now Ibn al-Ikshid Street), surrounded by palm trees and facing the Nile, stand two identical apartment buildings built in the 1930s for court jeweler Meyer Eliakim. For a time he lived in the one closer to the Nile with his wife and four daughters Lili, Vicki, Jackie and Gaby. Surviving members of his family can still be sighted at Longchamps during the Paris racing season. Among Eliakim's distinguished tenants at No. 86 was his son in law David Ades; businessman Ralph A. Harari (a nephew of next door neighbor Mrs. Joseph Mosseri Bey); bankers Abdalla and Maurice Zilkha of Banque Zilkha; Louis Van Damme, director of the Banque Belge; Jules Joseph Arnaud of the Anglo-Belgian Co.; Major (lawyer) William Roger Fanner; and Julian May Wright, magistrate. Also in residence for a shorter period were Egypt's respective ambassadors to London and Athens, Hassan Nachat Pasha and Ali Sirry Bey. This was certainly one of Giza's most sought out address. Among the present occupants are the parliamentary leader of the opposition, Yassin Serageldine and the elderly widow of dissident lawyer Mustafa Marei. Contiguous to Eliakim's two buildings is Villa No. 84 built in 1925 for Mohammed Kamel al-Bindari Pasha, Egypt's ambassador to Belgium and the USSR and sometime minister of health. When serving abroad, the pasha leased his villa in turn to the legations of Sweden and the Netherlands. The pasha would later live on the former khedivial dahabieh-houseboat 'Feirouz' and sell his villa to Syrian businessman Fouad Matouk and his wife Odette de Freige. At the breakup of the Matouk marriage the villa was leased out once again and is today occupied by a Saudi family. In view of its unkempt state and the overgrown vegetation which surrounds it, one can hardly tell that this art-deco house (interior designed by Jeansene and Krieger) is the work of architect Michel Libermann. Luckily, another one of his villas is in evidence further down the street. Next to No. 84 is a mansion whose various occupants do not want for celebrity status. Its owner between the late 1930s until 1961 was Charles Victor Castro whose business it was to sell agricultural pumps and Dodge cars. When at home in winter Castro and his wife Marguerite de Botton liked to entertain and during summer they did like most of their Giza neighbors, alternating between Alexandria and Europe's best resorts. The Castors were heavy luggage travelers taking with them their car, driver, European governess or nanny and their Great Dane. The Castros left Egypt in installments starting with Roland and Yolanda in the late 1940s. Guido followed in the late 1950s eventually settling in England in 1959. The Castro seniors joined their children in 1960/61 never to return. Yolanda would eventually visit Egypt as Lady Joseph; her husband, Sir Keith was Margaret Thatcher's trusted minister for industry and later, for education. In her book The Downing Street Years (Harper & Collins, 1993), Thatcher lauds the virtues of her minister recounting how he was one of her closest monetary advisors and mentors. In view of its excellent location, it was not long before Villa Castro with its priceless savonneries, French glazed windows and other accouterments, was snatched up successively by two privileged members of Egypt's new oligarchy. The first was President Nasser's daughter who sojourned there while her own villa was being readied in Heliopolis. The next occupant was President Anwar al-Sadat. It was during his reign that fanciful photos and historic soundbites emanated from No 82's interior, flashed via satellite around the globe on prime time news especially when Nixon, Kissinger, Carter, Walter Cronkite and Barbara Walters came calling. To accommodate Egypt's White House, so to speak, Villa Castro and its adjoining garden, where Rajah the Castros' Great Dane had once played unhindered, succumbed to major structural changes. Among them was the construction of an extra wing for Gladys Cotrell, Sadat's mother-in-law, and the extension of the first floor reception area so it now almost protrudes into the street. On the Nilefront a presidential heliport was constructed to accommodate the president's American-made choppers. When the pious president in the Savile Row suits was assassinated in a Field Marshall's uniform in October 1981, leading statesmen and reigning princes filed through Villa Castro's massive iron gates as they paid their respects to the grieving widow. Conspicuously absent were Arab dignitaries in their flowing white robes. To them Sadat had been a traitor who preferred Jews to Arabs. Today, Sadat's helipad is empty. Dignitaries rarely call on the feebly guarded villa which looks abandoned unless Sadat's widow Jehane Raouf is in town for otherwise she spends most of the year in the United States. In a bizarre sense, willingly or not, Giza's riverfront Jews were immortalized through their grand homes as these became embassies, courtly homes to the rich and famous, or the official residence for the nation's president. I enjoyed browsing through your pages and your articles have brought back many memories. A couple of small corrections. The villa across the pyramids road from Badia (now the Sheraton) on the rond=point at Giza, which was still there in 1976, used as a police station was built by my grandfather, Solomon Green, at the turn of the century. Next along, came the villa of one of his sons, Ralph, built in the twenties and my father's villa, built about 1930 by the French architect Max Edrei was fronting the Nile alongside that of Robert Greg, until it was bought by the Government in July 1956 to allow for the Bridge from Rhoda Island to the university to be built. Before that there was a very successful ferry run by a small felucca which took students who did not wish to take the tram. 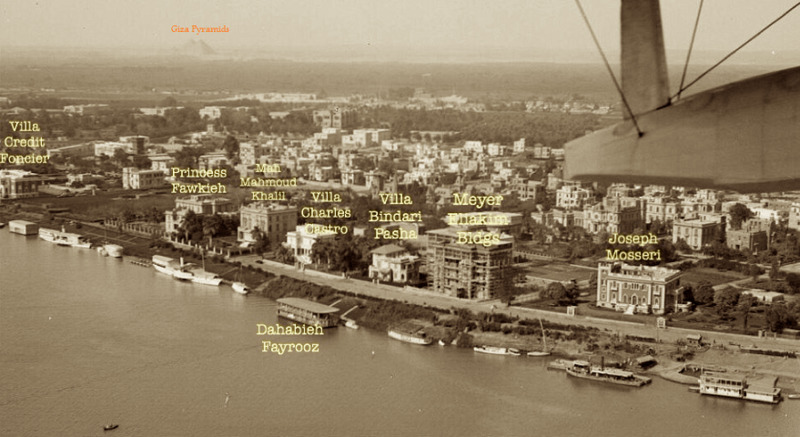 Actually until about 1936 the garden of the villa used to run down to the Nile, but as the corniche was called Sharia Farouk it was felt that it should continue past our houses all the way to the existing Rhoda bridge. Our own road was called Sharia Ibn Malek and, at one time there was no other house in it as our garden went as far as the main (pyramids) road and the land between us and the Saabs was farmed for flowers by a peasant family living in an extended mud hut. The land fronting the main road,also farmed by the peasant, was owned by my other grandfather and after the war was sold to Anis Serag el Din who put up a block of flats. I knew some of the peasant children quite well and sometimes played with them but I can no longer remember their names.